Can you remember the first time you experienced the joy of having bubbles blown at you from a wand dipped into a little plastic bottle? Did it seem like magic? Even when the bubbles burst? Did you ask for more and more? Imagine that instead of bubbles, these were orange and black butterflies. Monarch butterflies. Ones you could almost touch. Or ones that landed on you and remained for many minutes. 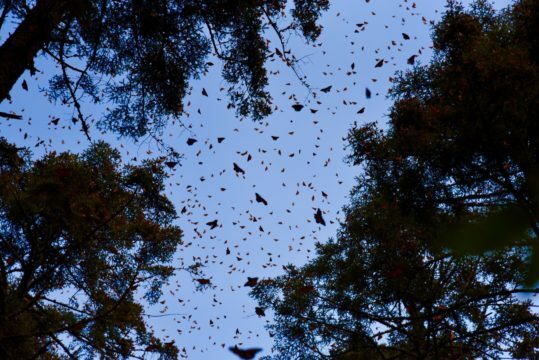 Now, multiply the number of bubbles/butterflies and that sense of wonder and delight by many hundreds or thousands, and you get just a sense of what Ellen and I experienced on a recent trip to Mexico to see where the Monarch butterflies migrate and winter. 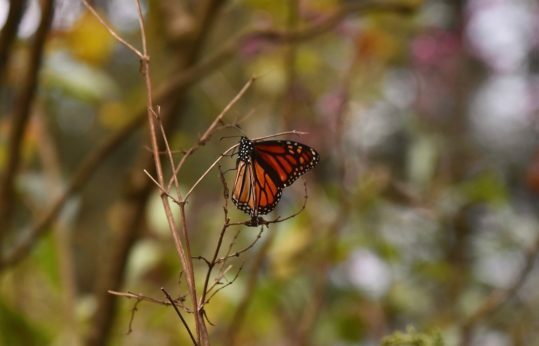 As you may know, many of the beautiful Monarchs travel south to winter in Mexico where they live for five or six months. Then, in the early spring they mate, go north from Mexico, lay their eggs on milkweed plants, and then die. This process repeats itself as three generations of Monarchs work their way north, often as far as the Great Lakes or Canada. Each of these generations lasts about two months. Then the great migration begins again. Despite never having been to the mountains in Mexico, these now fourth generation Monarchs set out on a mass migration of two to three thousand miles to a place they’ve never been and arrive at the exact locations and specific trees where their ancestors wintered the previous year. 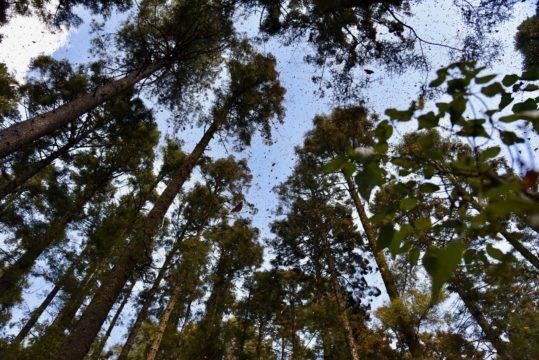 There are 14 Monarch sanctuaries, protected areas, in Mexico, and you can go to a number of them to experience what it is like for several million Monarchs to gather in one place. Under the auspices of Natural Habitat Adventures and the World Wildlife Fund, we joined with ten others and two wonderful guides to spend five days in mid-February chasing butterflies. We flew to Mexico City, went four hours due west by bus to the town of Angangueo where we stayed for three days. We went by open flat bed truck another 45 minutes where we then went by horseback another 45 minutes up into the mountains. Finally, we hiked for another 45 minutes or so to one of the Monarch sanctuaries, El Rosario. As we didn’t arrive until late afternoon the first day, most of the thousands and thousands (millions?) 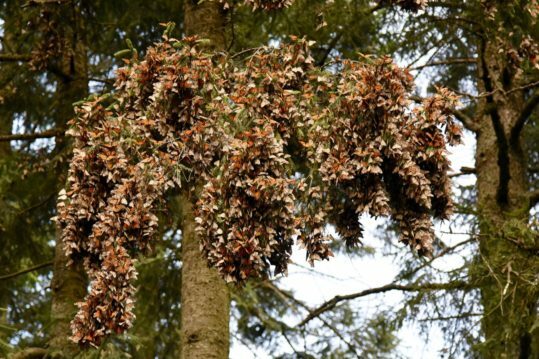 of Monarchs were huddled together on a few dozen trees, giving and getting warmth from each other. But there were some brave butterflies who left their perches and came near, some landing on us or simply hanging out on the ground or bushes nearby. The only noise we heard were our cameras taking hundreds and hundreds of photos, ‘up close and personal’ (and often just inches away). The most stunning aspect, for me, of this first encounter, however, was to see the trees laden with these marvelous butterflies. The next day we set out early to a second reserve, this one at Chincua. Again we went by truck, horseback, and hiking, and what a reward. As we were the first to arrive and because the day warmed and the sun came out, we were able to virtually be in the midst of the Monarchs flying about. 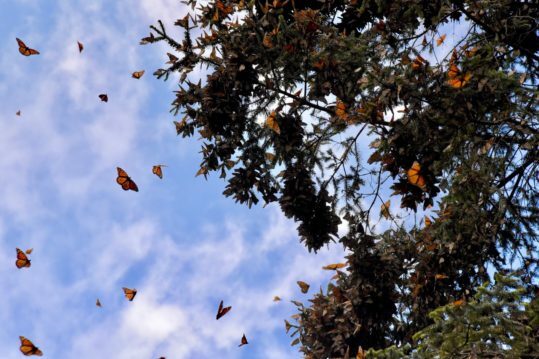 When a cloud would pass, the Monarchs would rush to find a place to retreat from the ‘cold,’ and we were then in the midst of thousands and thousands of butterflies (or as Ellen said, “It was as if we were inside a snow globe of butterflies”). 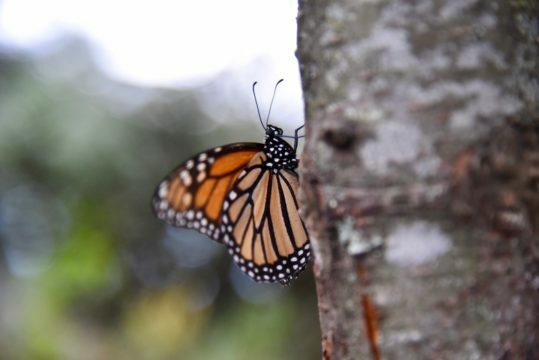 On our third day, we returned to El Rosario, and for some reason the butterflies had moved from what just a day or two previously had been their ‘trees of choice’ to different trees, new micro climates. 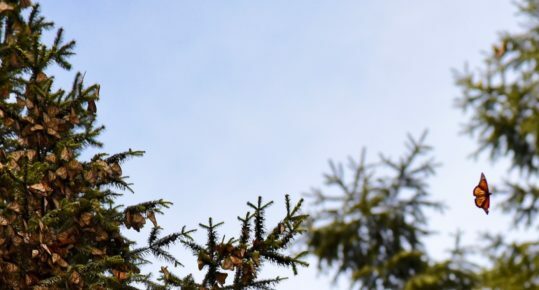 And most exciting, these trees were next to the path where we were able to look with wonder at how they clustered together, hanging on the pine or fir trees, waiting for the sun. As the sun came from behind the clouds, they began to open their wings and the trees seemed to magically transform in color. As long as the sun stayed out, the Monarchs left their trees and flew in front of us (to search for nectar?). Then, during a passing cloud, there would be a ‘mad scramble’ as they flew about, trying to decide where to go to sit out through the modest change in temperature. We couldn’t get enough of them. When our three days of ‘chasing’ the Monarchs concluded, I was left with three images and one question. First, even one Monarch resting on a bush, the ground, or on one of us, just inches way was thrilling. 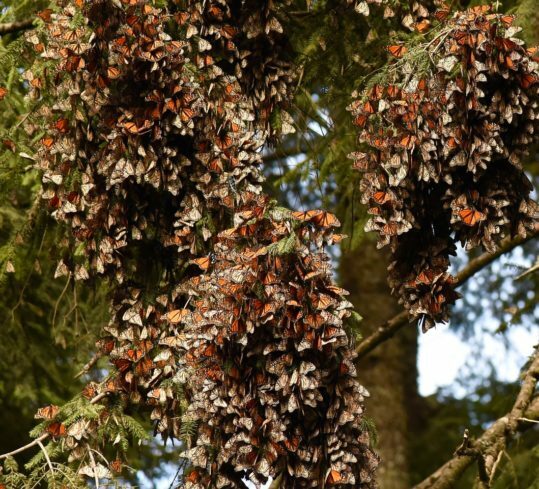 Second, an entire tree covered with thousands and thousands and thousands of Monarchs ‘hanging out’ and occasionally spreading their wings and, as a result, changing the color of the tree was mesmerizing. And particularly exciting was seeing a burst or flurry of uncountable numbers flying around, either enjoying the warmth or looking for a place to land. The one question, yet to be answered for me, is how do these Monarchs know where exactly to go on their great migration, given that they are at least four generations removed from having been to a specific area two or three thousand miles away? Below are a dozen of Ellen’s most favorite shots of the butterflies. Then, if you want to see more of her photos of our Mexico trip, there is a slide show which includes more pictures from our butterfly adventure and photos from our four days in Mexico City. 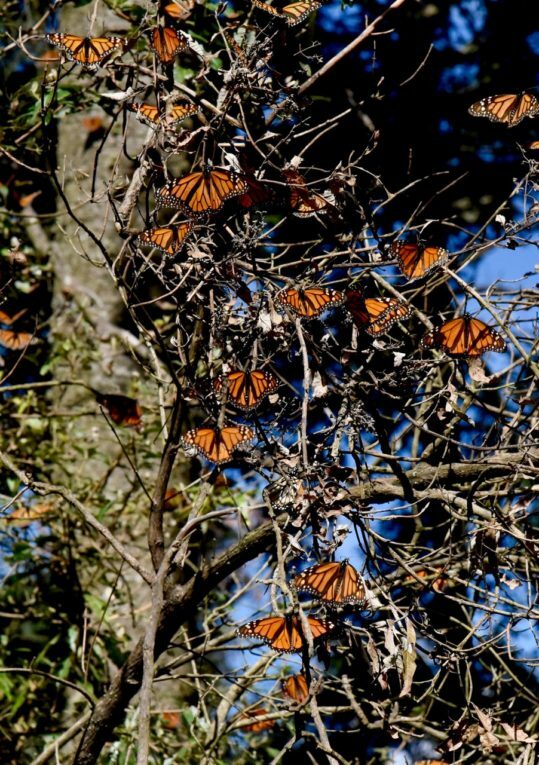 If you would like to see more photos, click on this link: Monarchs & Mexico: Thru Ellen’s Lens. Then, for the best viewing, click on the tiny, tiny arrow in the very small rectangular box at the top right of the opening page of the link to start the slide show. I’d highly recommend that you view all the photos in the largest size possible (full screen format) on a laptop or desktop computer. Wonderful. I am fascinated that they know how to return to that specific area in Mexico. Great pictures. Thank you so much, Richard. I thoroughly enjoyed hearing about this very magical experience. A deep bow, as always, to Ellen, for her extraordinary photos. I always considered the occasional summer appearance of Monarchs in New England as a special time. It’s very cool that you were able to witness this extraordinary gathering. I highly recommend the slideshow- especially loved the lily pond and the murals.